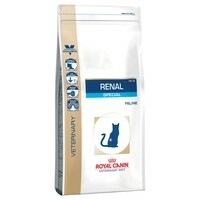 Royal Canin Renal Special Dry Food for Cats is a carefully balanced veterinary diet for cats with Chronic Kidney Disease (CKD); to reduce oxalate stone formation and balance the urine pH level. Containing a low phosphorus level and a careful balance of high-quality protein to reduce the workload on your cat’s kidneys, Royal Canin Renal Special is ideal for compensating for reduced kidney function and to reduce the risk of a harmful level of toxins building up in your cat’s blood. Royal Canin Special Vet Diet also has also been made with an enhanced palatability recipe, designed to tempt your cat and ensure that even the fussiest eater is catered for. Our 10 year old Ragdoll Aurora presented 5 years ago with acute kidney failure and was rushed from the vets by animal ambulance to Liverpool SATH for specialist treatment. After she was stabilised, one very small, infected and inactive kidney was removed and the other kidney has been supporting her ever since. She still was refusing to eat and had to be syringe fed pureed wet food (RC Renal Alutray) every 4 hours to prevent hepatic lipidosis. Aurora hates wet food and it was a struggle for nearly three months but we persevered. The remaining kidney is twice normal size and, with medication + a strict regime of extra water orally twice a day, she is doing fine. Of course, she cannot eat the protein rich food that our other Ragdolls eat so she was put on Royal Canin Renal Special Feline Dry RSF26 and absolutely loves it! She has gone from an underweight, short haired cat to a normal sized cat with a semi-long luxurious blue mitted coat. This dry food is so well liked that it's become the favorite 'treats' for most of our other cats who are very picky treat-wise. Excellent results from this outstanding specialist food.